The region encompassing Central and Eastern Europe and the former Soviet Union is unique in that many of the diaspora populations originating from these countries became such not only through international migration but also, more importantly, border shifts in the early 1990s. A significant share of the diaspora populations in this region came about as a result of the breakup of the three federal states at that time: the Soviet Union, Yugoslavia, and Czechoslovakia—all Communist and centrally planned economies. Further complicating the picture, still others currently reside outside of what they consider their ethnic homeland (for example, ethnic Russians living in Kazakhstan). The diaspora populations in the region's 29 countries (see Terminology) differ considerably in size, geographic dispersion, socioeconomic characteristics, and ties to their home countries. Tajikistan is currently the most remittance-dependent country in the world: remittances make up 47 percent of its gross domestic product (GDP). Many other Eurasian countries are among the top 30 countries in terms of remittances as a share of GDP, including Albania, Armenia, Bosnia and Herzegovina, Kyrgyz Republic, Moldova, and Serbia. Many of these and other countries have highly educated diaspora populations, which they seek to engage in knowledge and skills transfer. Throughout the region, diasporas' role in development is a particularly complex issue. Because of their unique historical circumstances, diaspora members have ties to their countries of origin that differ from those seen elsewhere in the world. In addition, new countries—otherwise occupied at their genesis—have only recently realized the potential of involving their large diaspora populations in economic development. This article provides an overview of the diaspora populations of post-Communist Eurasian countries, and also examines their governments' approaches and attitudes toward diaspora involvement in development. While some countries acknowledge migration in domestic policies and/or engage with their diasporas, many others—for political, cultural, and other reasons—are wary to do so. Following the Bolshevik Revolution in 1917, new Soviet leaders needed to take stock of the multinational empire that they were now ruling and used the results of the first Soviet census in 1926 to demarcate ethnic homelands. The resulting administrative geography was very complex, reflecting elements of administrative convenience, recognition of ethnic groups, and traditional borders. Of the 53 ethnic homelands created, 15 would become the successor states to the Soviet Union after World War II, when the Baltic states were incorporated into the Soviet Union (see Figures 1 and 2). Czechoslovakia also became an independent state in 1918. The two entities, the Czech Republic and Slovakia, peacefully became independent in 1993 in what is often referred to as the Velvet Divorce. The term Eurasia is often ambiguous but as used here refers to the 15 states of the former Soviet Union, the seven states of the former Yugoslavia, the two states of the former Czechoslovakia, and five states — Albania, Bulgaria, Hungary, Poland, and Romania — which have remained in their same borders since the 1990s. One major impediment to research on diasporas in Eurasia is the lack of comprehensive data on their numbers and characteristics. As a result, data on foreign-born populations used in this article refer to all Eurasian countries, including those in Western Europe (unless otherwise stated), while the focus of the discussion on migration and development policies is exclusively on the 29 countries that formed after the breakup of the three federal states in the 1990s. There are various definitions of the term diaspora; the critical element in Eurasia, as elsewhere, is the strength of diaspora members' sentimental and material links to their homelands. During the past several years, a few international databases for tracking diaspora and migrant populations began including countries that were formed in the early 1990s. While these data sources refer to individuals as foreign born or immigrants, the term diaspora is used in this article when discussing migration and development. During the Soviet period, there was little migration either in or out of the Soviet Union, though there was considerable internal migration. In 1989, just prior to the breakup of the Soviet Union, an estimated 28 million people within the country resided in a republic other than the one in which they were born, according to the World Bank. (The Soviet Union consisted of 15 Soviet Socialist republics, each an ethnically-based administrative territory.) Overall, with the addition of international migrants resulting from the breakup of the Soviet Union, the global migrant population reached around 155 million by 1990, or nearly 3 percent of the world's population (though estimates vary). Many people in the region also migrated as a result of the collapse of Communism and economic transition. According to the United Nations Global Migration Database (UNGMD), there were approximately 46 million people from Eurasian countries living outside their country of birth or country of citizenship in the mid-2000s. These diaspora populations amounted to over 11 percent of the total Eurasian population. In 2010, the emigrant population ranged from 3 percent of the population of the Czech Republic to 46 percent of the population of Albania (see Figure 3). According to the World Bank's Bilateral Migration and Remittances database (which assigns all migrants to a country, is scaled to match the 2010 global migration stock of 215.8 million global migrants, and includes only the 29 countries formed in the early 1990s), the size of the Eurasian diaspora population in 2010 was slightly lower — around 44.6 million. Each of the Eurasian countries is a nation-state based on one ethnic group. At the time of the breakup of the Soviet Union, 43.4 million persons (17 percent) of the 15 ethnic groups upon which the successor states are based were residing outside their ethnic homelands. One of the largest ethnic diasporas to emerge from the breakup of the Soviet Union was the 25.2 million Russians who lived in the non-Russian states of the former Soviet Union. The diaspora population created by the breakup of Yugoslavia in the early 1990s counted approximately 3.4 million ethnic diaspora members, which partially factored into the ethnic conflicts in the region. Eurasian immigrant populations are a mix of older and newer generations, reflecting different waves of emigration during World War I, World War II, the Cold War, and after the demise of Communism. The arrival patterns of Eurasian immigrants in the United States, too, reflect these waves. Overall, 30 percent of the total foreign-born population in the United States arrived in 2000 or later. Yet for Eurasian immigrants, the year of arrival varies by country: Albania, Bulgaria, Kazakhstan, Moldova, and Uzbekistan are among those sending significant shares of immigrants to the United States since 2000 (see Figure 4). In contrast, half or more of immigrants from Croatia, Hungary, Latvia, Macedonia/FYROM, and Poland had arrived before 1990. And many Eurasian immigrants arrived during the turbulent period of the 1990s, many as refugees. Source: U.S. Census Bureau, 2007-09. The Eurasian immigrant populations in the United States are generally highly educated. Nationally, 18 percent of the U.S. population has a bachelor's degree. For nearly all Eurasian immigrant populations, that share is higher, and in most cases much higher. Of the largest foreign-born populations from Eurasia, 29 percent of those from Russia, 27 percent from Ukraine, and 20 percent from Romania have a bachelor's degree. The only exceptions are the foreign born from Croatia, Hungary, Macedonia/FYROM, and Poland, reflecting the fact that these are older immigrant populations—both in terms of age and length of stay. In fact, data suggest that migrants from Eurasian countries—regardless of destination country—are more highly educated than average. The average tertiary-educated emigration rate worldwide in 2010 was 5.4 percent. For Eurasian countries for which data are available, that rate is substantially higher, with seven countries (Albania, Armenia, Croatia, Kazakhstan, Kyrgyz Republic, Moldova, and Tajikistan) at more than 20 percent, and another 11 countries (Belarus, Estonia, Georgia, Hungary, Latvia, Lithuania, Macedonia/FYROM, Montenegro, Poland, Romania, Serbia, Turkmenistan) at between 10 and 20 percent. Globally, Eurasian immigrant populations are concentrated in a few destination countries, with over half residing in just five countries—Russia (11.8 million), Germany (5.2 million), Ukraine (4.9 million), Kazakhstan (2.9 million), and the United States (2.3 million)—clearly reflecting considerable migration among the former Soviet Union states. There are also sizable Eurasian foreign-born populations in other countries of Western Europe such as Austria, Greece, Italy, Spain, and the United Kingdom, as well as in Canada. Given geographic proximity, history, and other factors, migrants from the Commonwealth of Independent States (CIS) countries—a regional organization comprising nine former Soviet republics—choose different destinations than migrants from Eastern and Central Europe. For most CIS countries, the major destination country is Russia, followed either by the Ukraine or a neighboring country. For the immigrant populations from Eastern and Central Europe, Western Europe, and the United States are primary destinations (see Table 1). In addition, since the breakup of the Soviet Union, nearly 1 million Soviet Jews have settled in Israel thanks to the nation's Law of Return. This group makes up half of the foreign-born population in Israel and about one-fifth of the country's overall population. Source: World Bank, Bilateral Migration and Remittances 2010, November 2010. Eurasia Reaching Out to its Diaspora Populations? There are three actors in any diaspora relationship: the homeland, the host country, and diaspora groups. The attitudes and policies of each diaspora determine how much it can contribute to development in the origin country. In Eurasia, the relationship between these actors is highly intricate due to the unique political, cultural, linguistic, and historical threads that make up the fabric of many of the societies in the region. Awareness of the potential for incorporating diaspora populations into development at home is rather recent in Eurasian countries. Most either do not have policies focused on their diaspora populations, or if they do, have only developed them recently. Few explicitly link diaspora policy to development policy in the country. Most link diaspora policy to foreign policy and for that reason, diaspora offices are often housed within ministries of foreign affairs as opposed to governmental agencies designed specifically to support diasporas such as in India. Four countries have established separate ministries devoted to diaspora affairs (Armenia, Georgia, Serbia, and Kosovo) while a number of others have established subministerial departments (Albania, Bosnia and Herzegovina, Bulgaria, Czech Republic, Kazakhstan, Latvia, Macedonia/FYROM, Montenegro, Poland, Romania, Russia, and Uzbekistan). Azerbaijan, Hungary, Lithuania, Slovakia, Slovenia, Tajikistan, and Ukraine have established other administrative arrangements such as interministerial committees, while Belarus, Croatia, Estonia, Moldova, Kyrgyz Republic, and Turkmenistan have not created any office to coordinate relations with diaspora populations. National diaspora policies are often multifaceted, seeking multiple types of engagement with diaspora populations. A review of current policies, public discourse, and diaspora organizations reveals the extent to which elements such as remittances, cooperation with highly skilled diasporas, repatriation, and cultural preservation are prioritized. In remittance-dependent countries such as Albania, Bosnia and Herzegovina, Moldova, and Tajikistan, diaspora policies often emphasize increased or improved remittances as a top priority. In Tajikistan, for example, where remittances in 2011 accounted for 47 percent of national GDP, much of the focus of government policy has been on facilitating labor migration and reducing the cost of remittance transfers from abroad. At a recent meeting convened in Helsinki, Tajik President Emomalii Rahmon reaffirmed the government's commitment to engaging its diaspora in the "construction processes in Tajikistan," emphasizing the role of compatriots living abroad as "regular partners of the government…in the process of sustainable development of the republic." Other countries—such as Serbia, Slovenia, Poland, and Russia—emphasize the return or engagement of highly skilled diaspora members. In January 2011, the Office of the Government of the Republic of Slovenia for Slovenians Abroad released an action plan, On the Cooperation between Slovenian Scientists and other Topmost Experts from Abroad. Recognizing that at least 10 percent of all Slovenian researchers are abroad, the plan presents seven goals to promote the engagement of highly skilled diaspora members and to "enable conditions for the return of Slovenian scientists to the Republic of Slovenia." Moreover, Poland's Foreign Policy Priorities 2012-2016 indicates the government's support of the Polish diaspora and Poles living abroad, emphasizing that "the more powerful their position, the more effective they are in this process." Likewise, the Implementation of the State Programme to Assist Voluntary Resettlement of Compatriots Living Abroad to the Russian Federation confirms the Russian government's commitment to attracting new potential from overseas citizens while concurrently addressing the nation's demographic demands. Although the government of Serbia does not appear to have a formalized policy targeting its highly skilled diaspora members, groups such as the Serbian City Club in London have played a prominent role in this area through initiatives such as the Brain Drain Reversal Project. Relying on diasporas to compensate for demographic decline is yet another major policy focus and is widely publicized in countries such as Estonia, Latvia, and Kazakhstan. Emphasizing that the diaspora is very much considered part of the nation, the Latvian Foreign Policy Guidelines for 2006-10 underscores the importance of retaining diaspora members, particularly in light of the nation's demographic situation. Estonian policies to encourage overseas citizens to repatriate are also likely motivated by demographic and cultural realities on the ground. Cultural and language preservation is the main focus of diaspora policy in the Czech Republic and Slovakia, and part of diaspora policy for nearly every country in the region. Hungary's diaspora policy, grounded in the Act on Hungarians Living in Neighboring Countries, seems to be focused primarily on the preservation of its national identity and Hungarian minorities in neighboring states. A number of countries appear to have rather comprehensive diaspora policies, including Armenia, Bulgaria, Georgia, Lithuania, Montenegro, and Romania. Lithuania's diaspora policy, for example, falls under the auspices of a handful of government institutions, including the Department of National Minorities and Lithuanians Living Abroad under the government of the Republic of Lithuania (DNMLLA), and nongovernmental organizations such as the World Lithuanian Community (WLC) and Lithuanian Communities Abroad. It is codified by a number of legal acts and the country's Long-term Strategy of State Relations with Lithuanians Living Abroad for the Year 2008-2020. Countries such as Belarus, Croatia, Macedonia/FYROM, and Ukraine have only recently developed diaspora policies. In fact, the Belarusian Ministry of Foreign Affairs held a roundtable discussion in May 2013 on a draft law—On Belarusians Living Abroad—that seeks to foster greater cooperation among Belarus and its diaspora. Although Kyrgyz Republic is taking a number of steps to reach out to and protect its large diaspora population in Russia, it lacks a formal policy. Moreover, the lack of information available on diaspora policies in Turkmenistan and Uzbekistan suggests that these countries likely pay little regard to their diaspora populations. Russian migration policy underwent several policy reversals during the post-Soviet period, from being quite restrictive toward labor migrants to more recently encouraging inflows to compensate for the country's population decline (but carefully regulating their entrance and stay). With recent resource-driven economic growth in Russia, demand for labor migrants from elsewhere in the region will continue. For the lower-income countries in the region, labor migration to Russia has become institutionalized, and for many families in these countries, sending migrants to Russia has become a normal activity. In Western Europe, initial fears of massive migration from the east following the collapse of Communism never materialized. The European Union has gradually opened its doors to many Eurasian countries, a number of which have become EU members. However, the European Union continues to restrict entrance to migrants from some newer Member States, including those from Central and Eastern Europe and the former Soviet Union. 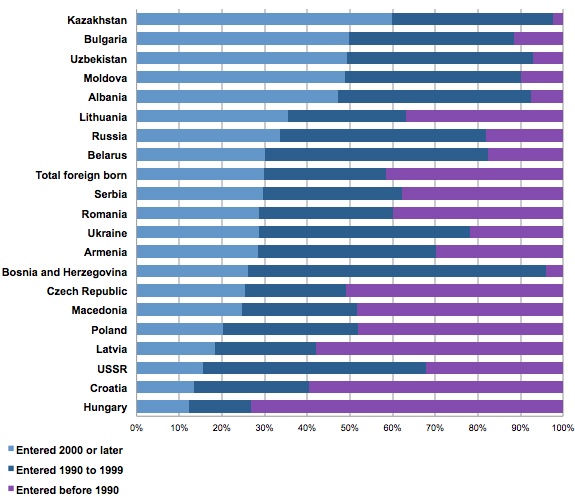 While large-scale skilled emigration—as is the case for many Eurasian countries today—may have long-term implications for home-country development, income earned and skills acquired by diaspora populations abroad are major factors shaping how and how much individuals may contribute to homeland development in the short term. Another critical factor is indeed the extent to which governments are willing to engage their diaspora populations for development purposes. However the case of Eurasia, as previously noted, is unique due to major shocks in recent history including political restructuring, ethnic conflicts, and mass international migration largely linked to border shifts. Both ethnicity and the idea of a homeland are social constructs, as is nationality. An important question surrounding diaspora migration in the post-Communist context is whether people ascribe to designations of nationality, and the strength of their loyalty and ties to ethnic homelands. While not all Eurasian diaspora members will have the desire to engage with their homelands, many will and—given their size and education and skill levels—they could make important contributions to development in their omelands. Agunias, Dovelyn Rannveig, ed. 2009. Closing the Distance: How Governments Strengthen Ties with Their Diasporas. Washington, DC: Migration Policy Institute. Beusse, Mareike. 2009. Repatriation Policies and Practices: A Comparative Overview of the Repatriation Policies and Practices of Other EU Member States. Tallinn, Estonia: EESTI Migratioonifond. Department of National Minorities and Lithuanians Living Abroad. Lithuanian Diaspora Policy Overview. Available online. Heleniak, Timothy. 2011. Harnessing the Diaspora for Development in Europe and Central Asia. Report No. 63780-ECA, Poverty Reduction and Economic Management Unit, Europe and Central Asia Region, World Bank, September 22. Kruger, Martha. 2005. Israel: Balancing Demographics in the Jewish State. Migration Information Source, July 2005. Available online. Magocsi, Paul Robert. 2002. Historical Atlas of Central Europe. Seattle: University of Washington Press. Mansoor, Ali and Bryce Quillin. 2007. Migration and Remittances: Eastern Europe and the Former Soviet Union. Washington, DC: The World Bank. Ministry of Foreign Affairs of Hungary. Act on Hungarians Living in Neighboring Countries: Interests and Goals. Available online. Ministry of Foreign Affairs of the Republic of Latvia. Latvia's Foreign Policy Guidelines 2006-2010. Available online. Ministry of Foreign Affairs of the Republic of Poland. 2012. Polish Foreign Policy Priorities 2012-2016. Available online. Newland, Kathleen, ed. 2010. Diasporas: New Partners in Global Development Policy. Washington, DC: Migration Policy Institute. Office of the Government of the Republic of Slovenia for Slovenians Abroad. 2011. Action Plan Regarding Co-Operation with Slovenian Scientists and Other Top Experts Abroad. President of Russia. Executive Order on the State Programme to Resettle Compatriots Living Abroad to Russia. Press release, September 15, 2012. Available online. Serbian City Club. Available online. United Nations Population Division. 2011. United Nations Global Migration Database v.0.3.6. Available online. U.S. Census Bureau. 2007-09. American Community Survey. Available online. Vezzoli, Simona and Thomas Lacroix. 2010. Building Bonds for Migration and Development : Diaspora Engagement Policies of Ghana, India and Serbia. Eschborn, Germany: Deutsche Gesellschaft für Technische Zusammenarbeit. Available online. World Bank. 2012. 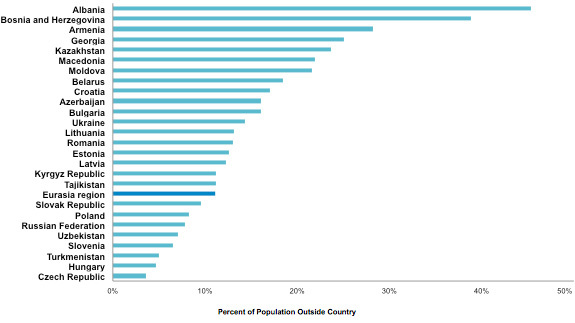 Developing Countries to Receive Over $400 Billion in Remittances in 2012. Press release, November 20, 2012. Available online. World Bank. 2010. Migration and Remittances Unit. Bilateral Migration Matrix 2010. Available online.